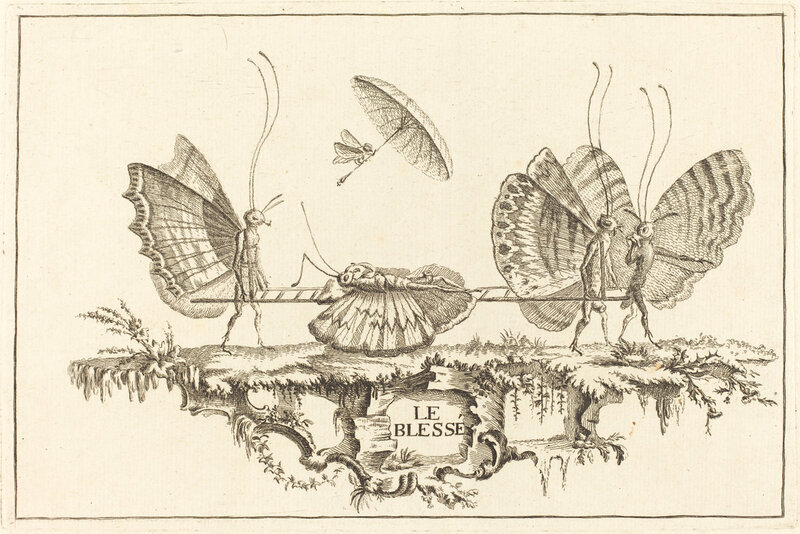 Anthropomorphic monkeys ran rabid through interior designs during the early to mid 18th century, and Charles-Germain de Saint-Aubin put his spin on the trend by creating his human butterflies. 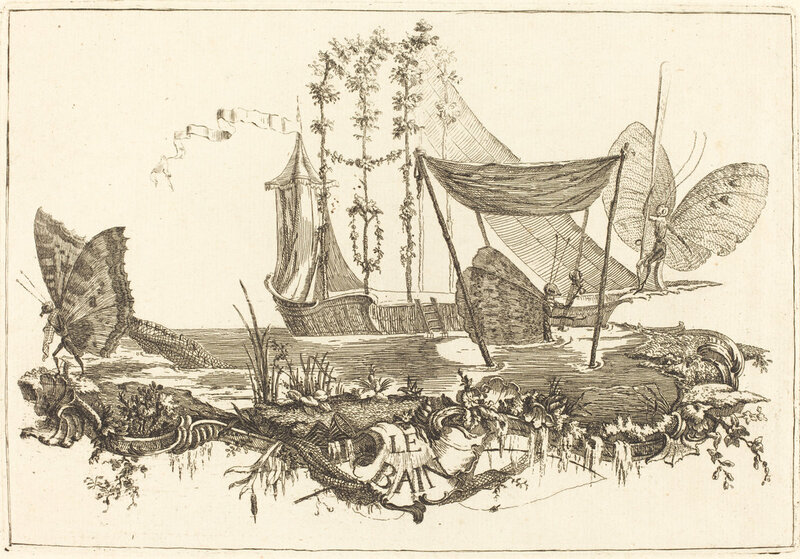 If you’re not familiar with Saint-Aubin, he had two claims to fame beyond his body of work. 1. He came from a large French family of creatives, with six of the seven children finding work as draughtsman, etchers, and designers. 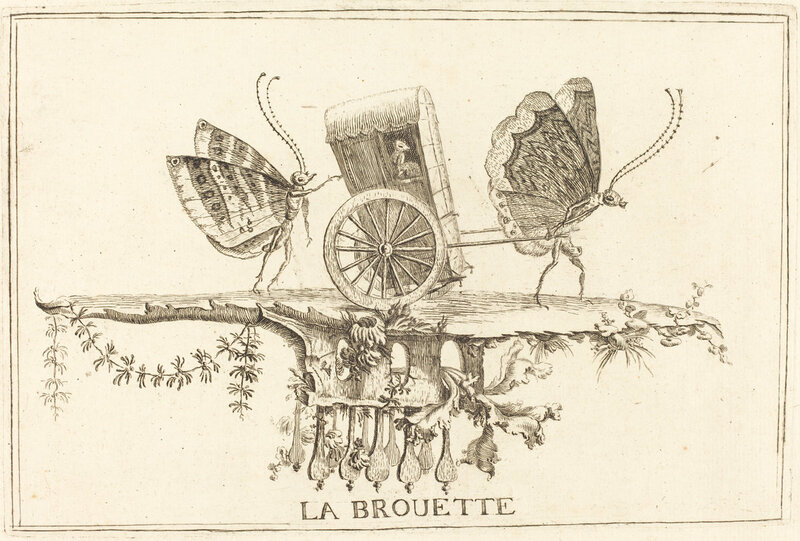 His younger brother Gabriel-Jacques is noteworthy for having studied with Francois Boucher and chronicling daily Parisian life, but unfortunately died penniless and largely unknown. 2. 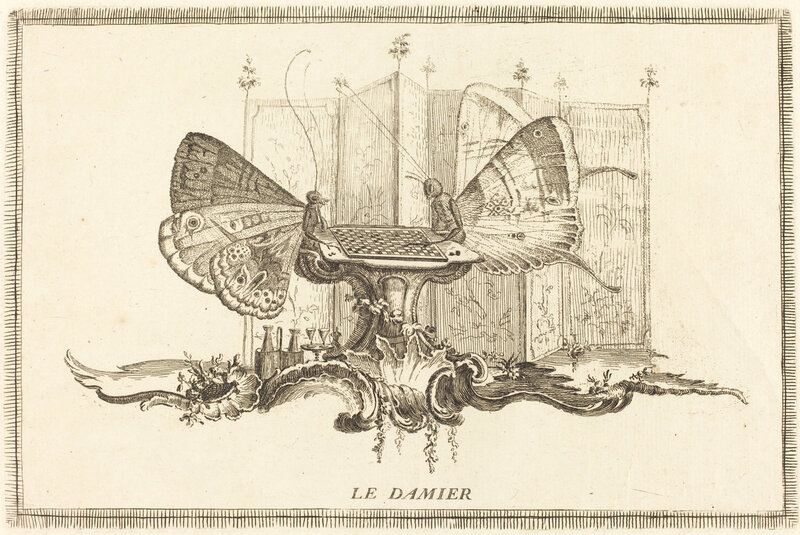 He occupied the official position of Designer of Embroidery and Lace to the King’s Wardrobe for King Louis XV. Fun day job, right? His parents were embroiderers, and though he followed in their footsteps, spiffing up the king wasn’t his only pursuit. 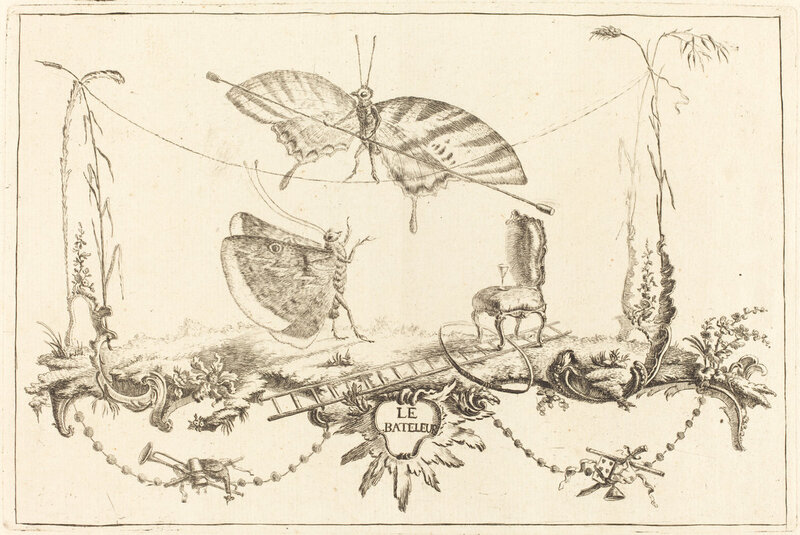 In addition to authoring a scandalous book that required his anonymity, he etched what remains his most popular series: Essay de Papillonneries Humaines (1756). 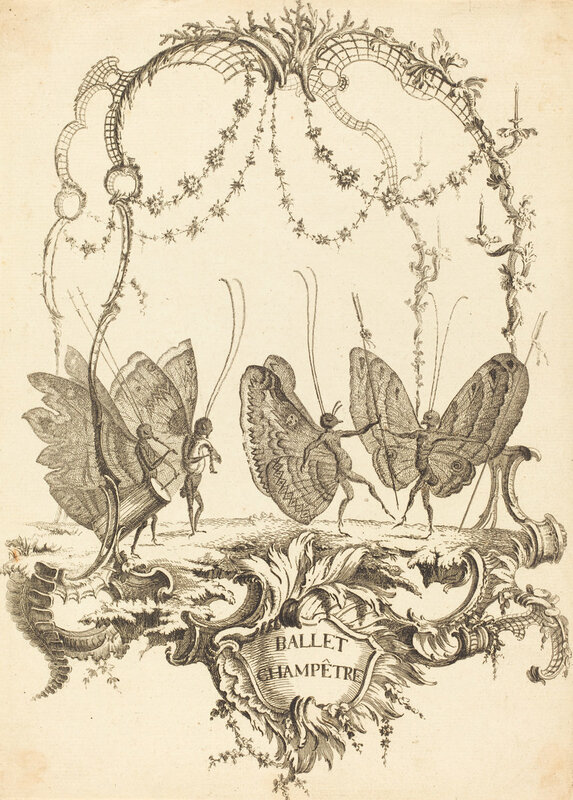 Then the energetic pursuits of the acrobat and the duel…. And what is an injured person to do but play checkers and get carted around in a litter? And when that gets dull? Well, one can always ride around on a turtle. Ah, it’s hard being a butterfly. 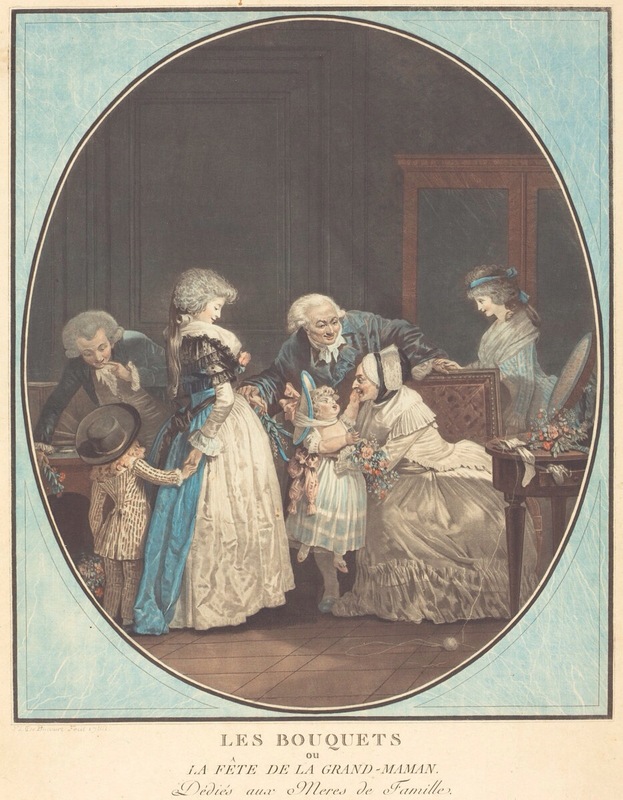 Grandmother’s party is popping with fashionable details: the little boy in a striped suit, the chubby cheeked toddler’s bonnet that matches maman’s, and Maman. The hedgehog hairstyle she’s sporting isn’t too hot, but how about the electric blue paired with a black lace and silk wrapper? 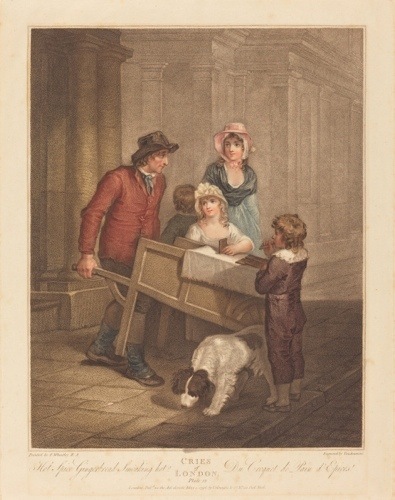 All in all the etching, dedicated to mothers, is a quaint family scene from an artist and social satirist who built up a body of work painting racier images. 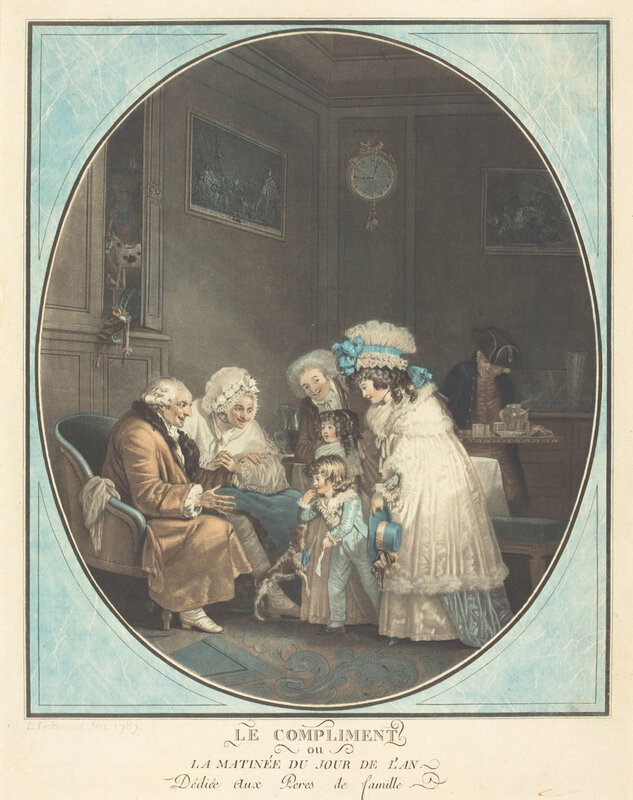 You may compare it with Debucourt’s 1787 companion piece that is dedicated to fathers. As is often the case, I recently came across a very dry history book with some hidden gems in it. Miniatures: Ancient and Modern was written by Cyril Davenport and published in 1908 and although I wouldn’t recommend reading it if you’re a miniaturist dilettante like I am, it does offer a useful perspective on how English miniatures changed from the 16th through the 19th centuries. The short answer is not much in terms of shape and overall presentation. 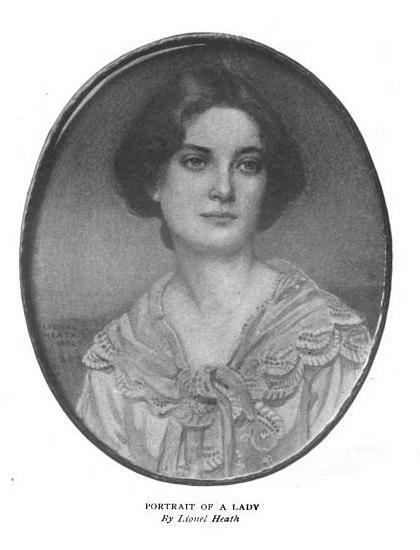 Excluding the style exhibited in the day’s favored painter, miniature portraits gradually grew more sophisticated in terms of backgrounds and range of mediums, but they are still miniatures. The 16th century Tudor period marks the first time in English history when miniatures appear in large numbers. They are influenced by the work of Hans Holbein, the younger and are fairly uniform in design. 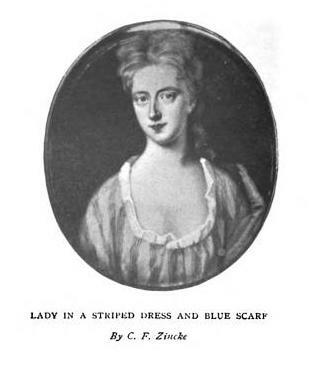 Simple blue or red backgrounds predominate and men are the likeliest subjects, although important high-born ladies and Queen Elizabeth do appear. 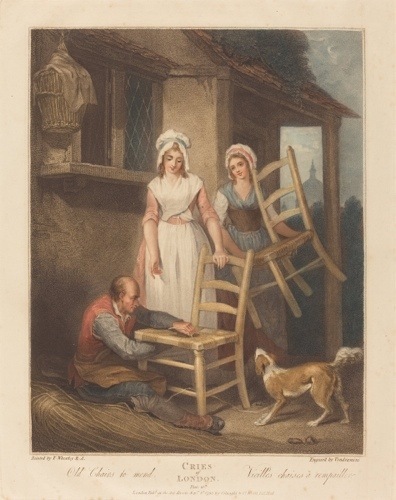 The shape of the miniature is round, the medium gouache or oils, on vellum or paper, wood or metal, respectively, and no shadows present themselves on the portrait itself. 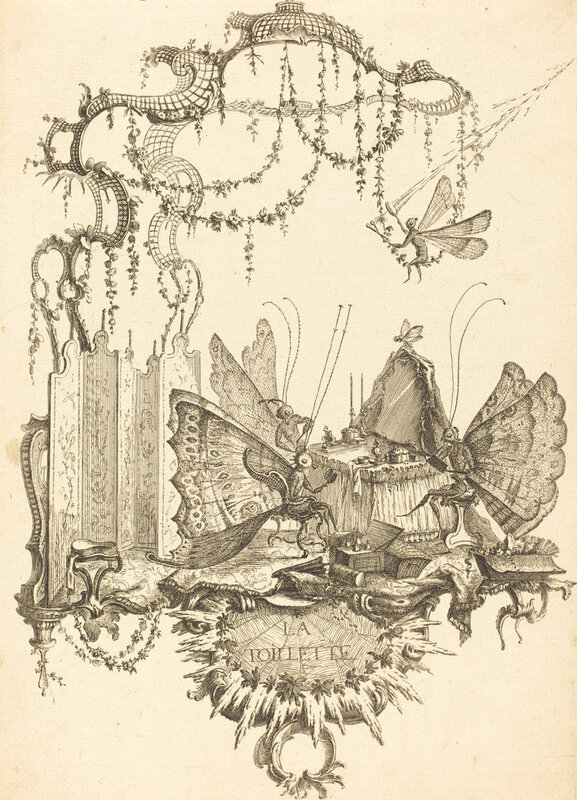 Davenport’s definition of a miniature is no larger than 7×7 inches, which sounds fairly large to me if you wanted to admire someone in the palm of your hand (I always thought miniatures were somewhere in the range of 2×2 inches or less, but I guess not). Anything larger than 7×7 inches gets classified as a cabinet painting, which would measure no more than 2×2 feet. 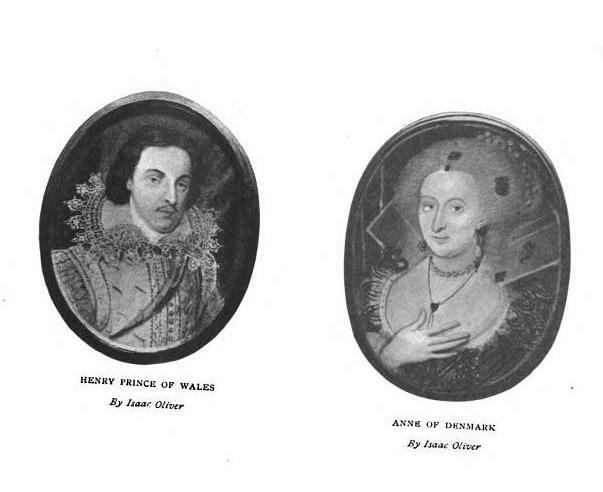 The black and white mother and son portrait miniatures are from Elizabeth’s reign. 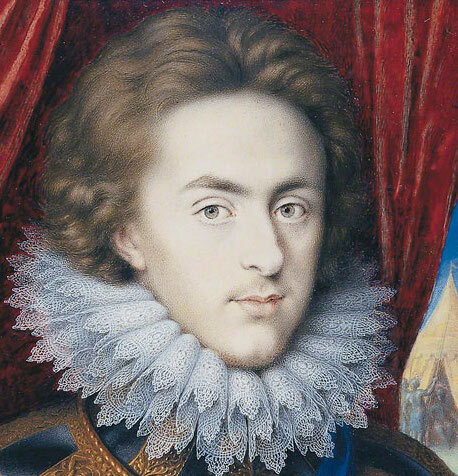 If you do know what Henry, Prince of Wales looks like, you might be wondering if this miniature is actually of his younger brother, Charles I. Here’s a portrait from 1610-12 painted shortly before Henry death at age 18, making the age depicted in the miniature improbable. 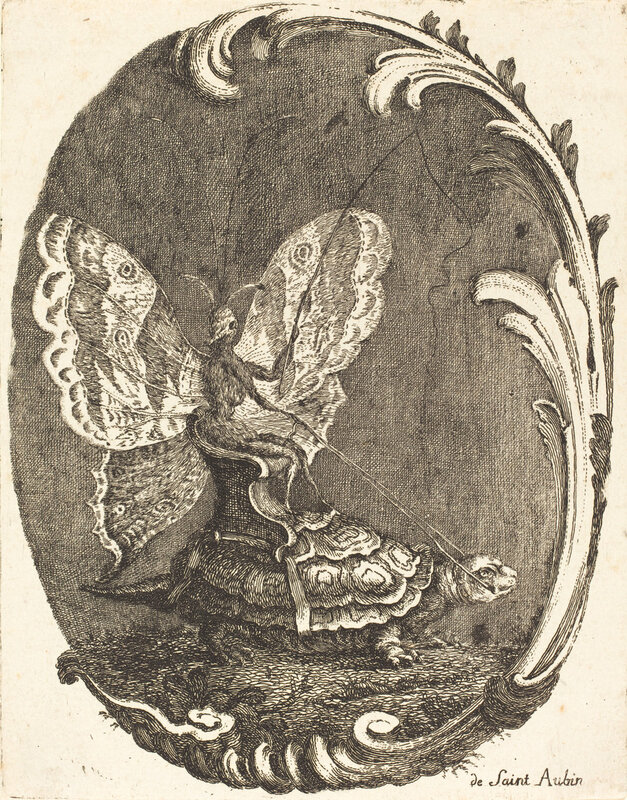 Maybe the miniature below is a keepsake of what Henry would have looked like if he hadn’t died (hmm, I wonder if that was done)? Or maybe the painter sucked at his art? Another of history’s mysteries, if you’re up for some sleuthing. You can see Anne’s miniature in color here–the jewels in her hair and ruff are crazy! The style of the 17th century Stuart period takes a nod from the work of Anthony van Dyck. Instead of being strictly blue or red, backgrounds add distinctive scenery and short oval shapes compete with the rounds of the previous century. The mediums have not yet changed. I personally like the first miniature of a Lady as Flora that was painted by Issac Oliver between 1575 and his death in 1617, making it straddle the Tudor and Stuart period. The duke in the second miniature has smug looking lips though, so I can’t recommend him. Before daguerrotypes came onto the scene and resounded the miniature death knell, the third period extended into the 18th and 19th centuries. 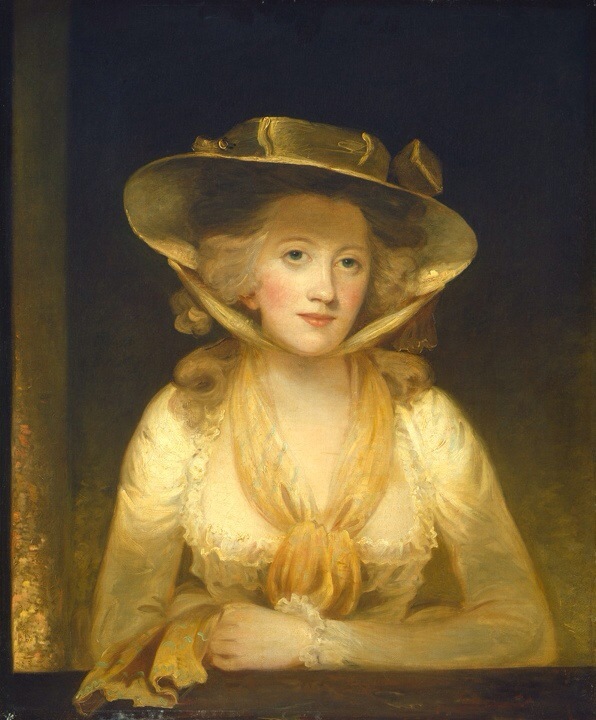 They styles is a reflection of Sir Joshua Reynolds’s paintings. Transparent watercolors were introduced, the shape turned oval, and ivory is a popular medium on which to paint. Ladies also start to appear in miniatures with regularity, though I must say I’ve seen a lot of ladies in 17th century miniatures. The first three below are 18th century, the fourth is from the 19th, and the fifth is late 19th to early 20th century. One last medium that I haven’t mentioned is enamel. Portraits on enamel have been around since the Byzantine period and during the 16th-19th centuries, were more popular on the continent than in England. I like how glossy they look. 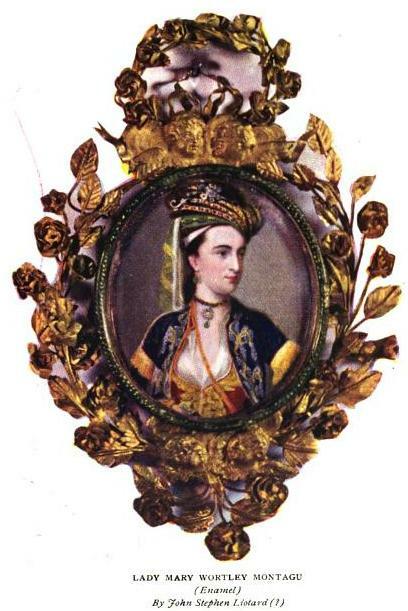 The colored Mary Wortley Montagu miniature at the top of the post is also enamel. Unlike miniatures from the 16th century onward, early examples of Roman miniatures from the first and second centuries A.D. were painted on gold leaf and encased in glass plaques. The Greeks produced encaustic miniatures, painted on wood with hot beeswax, while Renaissance Italians and Germans also excelled at encaustic works, setting their miniatures in relief with most of their subjects in profile. 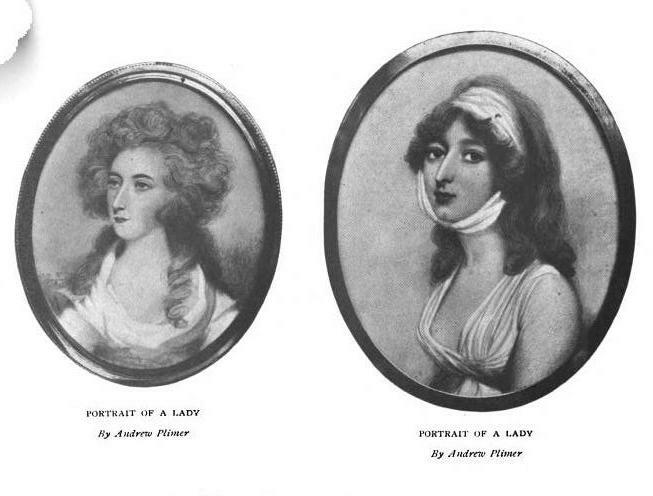 Clearly, there’s always been a desire to carry a beloved’s portrait around, making me think that miniatures are kind of romantic. Yes, they were given as diplomatic gifts and created to commemorate an age or occasion, but I can’t help but feel that many of them are as sentimental as a picture or a photograph in locket, which has got me thinking . . . what’s the history of lockets? 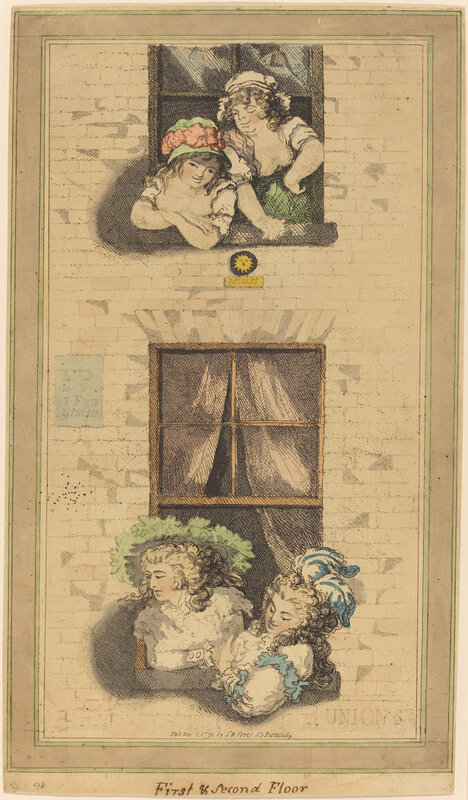 And if you’d like to know what was going on across the pond, visit the Metropolitan’s Museum of 18th century American miniatures and 19th century American miniatures. Of particular note is the daring Sarah Goodridge’s self-portrait. Gotta love a lady with pluck! Before yesterday, I had never heard of such a thing. Wax figures like Madame Tussaud’s? Of course. But small, uncomely representations of monarchs, mistresses, noble folk? I am fascinated. 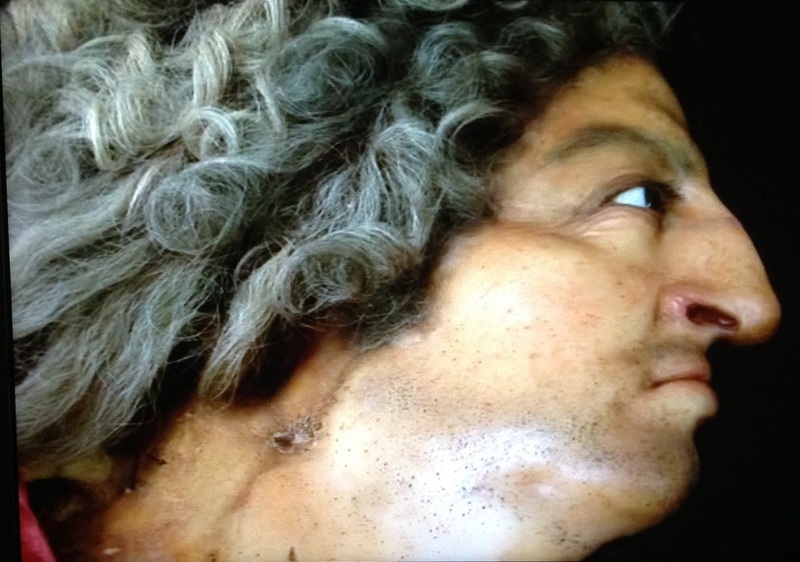 Somehow in the two times I visited Versailles I missed Louis XIV’s 1706 wax portrait. Too distracted by the gilt, no doubt. What’s peculiar about this buste is what’s most obvious. Apart from the fact he looks dusted with flour–an ill omen caused by bad reproduction–he’s got pockmarks, a five o’clock shadow, and age spots. If you can’t see them in the first picture, my lack of HD quality has dashed the clarity (Super clear and creepy whole bust here). 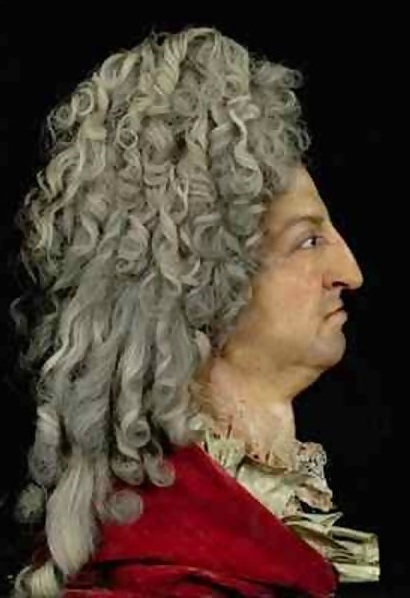 To be fair, Antoine Benoist molded his creation when Louis XIV was an old man. 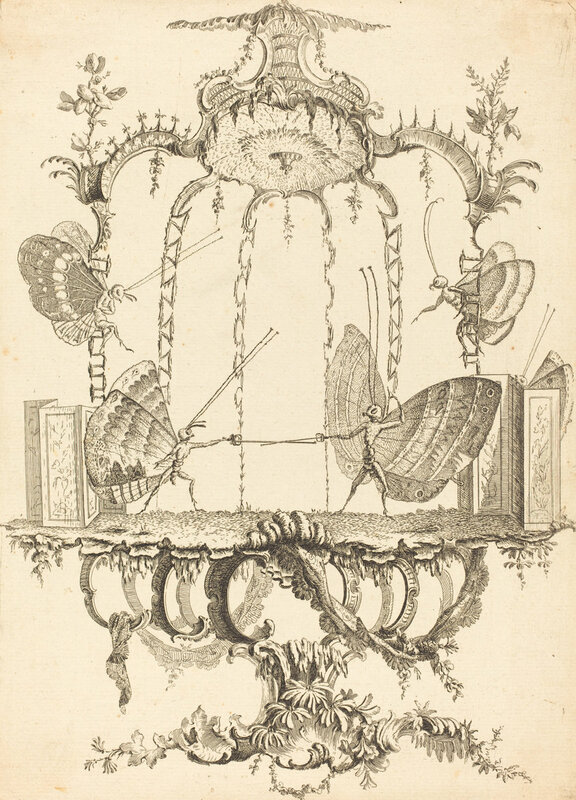 The artist was hardly the first wax artist, but he accomplished two feats which secured him favor at Versailles. 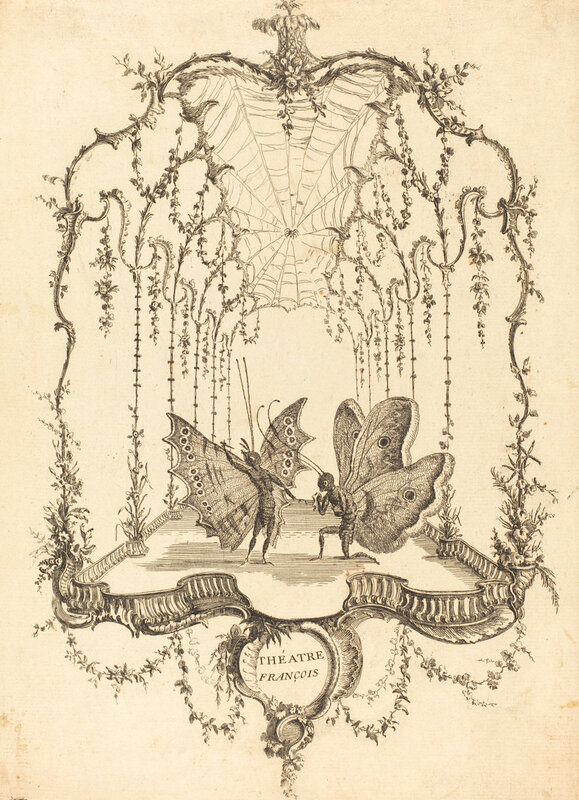 First, Benoist capitalized on his art form when few had yet to do so; and second, he perfected color waxworks. Louis looks real in the way that dead people look real, but in examining this work, I sense the accomplishment. I almost believe I’ve seen Louis on the hay-strewn street. His eyes, by the way, are hunter’s green or maybe hazel. They could also be brown. It’s hard to tell. The video about the restoration work by Versailles provides the closest look. 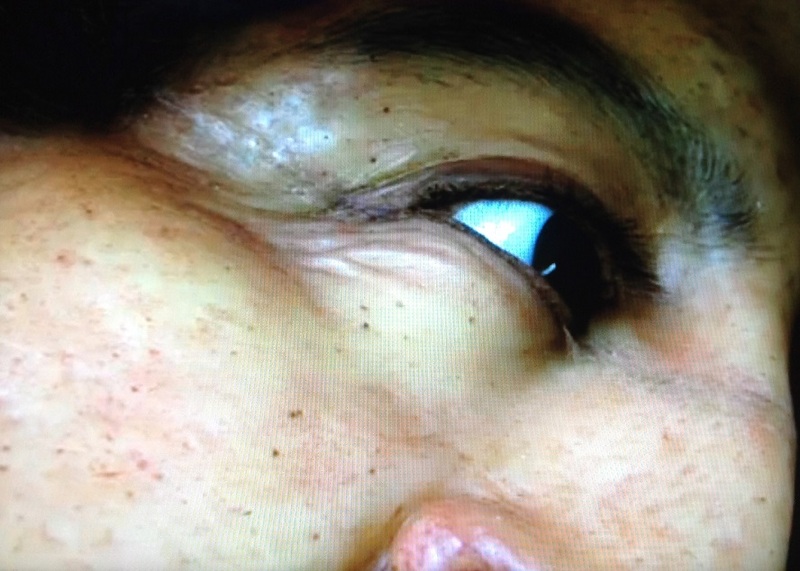 Watching it, you can even see the individual scars, including the thin, half-inch scar slashing at an angle above the corner of his right lip. What’s your take on wax portraits? Predecessor of Photoshop? Prefer a potentially blander, perfected prettiness over the realer thing? I’m undecided but think I prefer both. Benoist’s representation of Louis is considered the sun king’s most accurate likeness in existence. 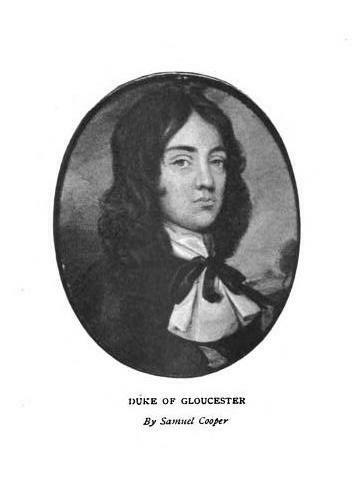 But it’s too bad he couldn’t have come along in Louis’s youth; the contrast would’ve been marvelous to behold. I have an affection for rays. I’ve watched them sleep in a secluded bay under full moonlight, glide between channels of mangroves, and fly beneath the seawater as if they’ve wings. They’re creatures possessed of a quiet grace: Stay still in the water beside them and they’ll graze your leg if you don’t fear their spiked tail. Mostly, though, you wouldn’t want to. As Monsieur Chardin shows us, they are better off beyond the hands of man. Yes, I am sentimental about rays. 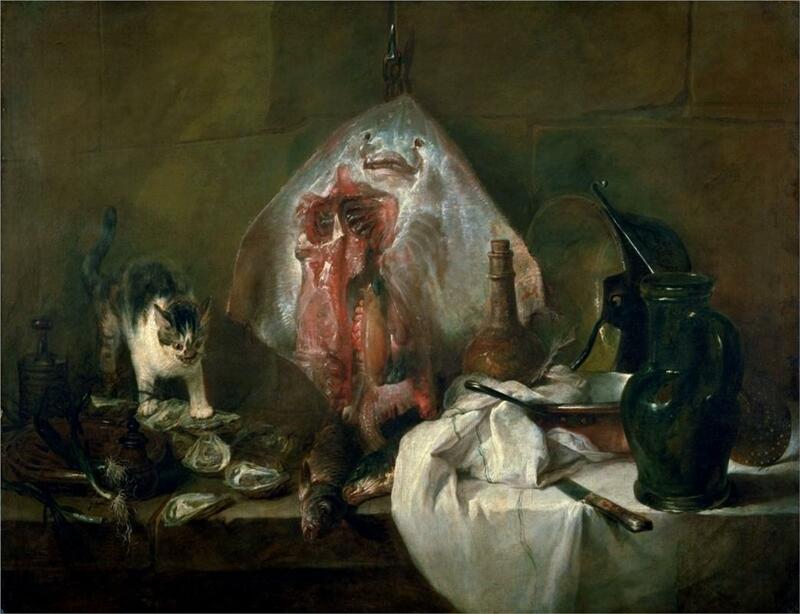 Gazing at Chardin’s The Ray, or The Kitchen Interior plumbs from me a visceral reaction: repulsion. The tableau is unsettling and provocative, inciting neither the appetite nor the anticipation of gastronomic pleasure. The anthropomorphic ray has a face reminiscent of a sad clown or a person, however comically, pleading for mercy before death. Apart from the indignity of being eviscerated, he emblazons the wall with a natural opalescent splendor, but the eye doesn’t stray far from raw flesh; he’s hung on a hook until he’s chopped and plopped in a pot. The sole living object in the painting is the cat. Perched in maniacal rapture, the feline is takings its chance on slurping the glutinous flesh of a half-dozen oysters before it’s swatted off the counter. The instruments of death–i.e. kitchen pans and cutlery–await the arrival of the cook. But what is being said about death here and what of life? 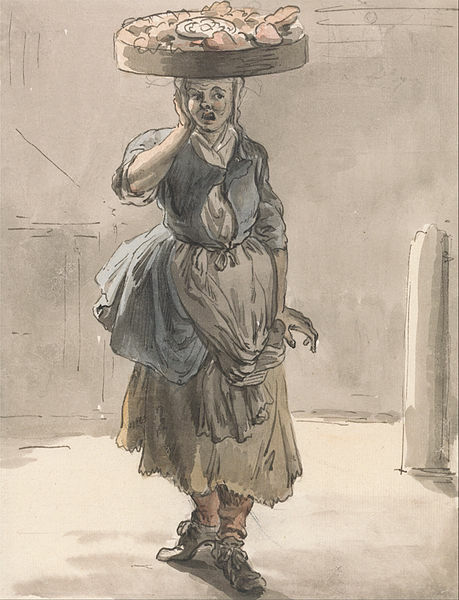 What did Chardin intend? Interpretations range from religious overtones of Christ and martyrs, to man versus nature, to the simplest explanation: rays or skates were a regular fixture in French fish markets. No need for squeamishness here. Play find the skate! 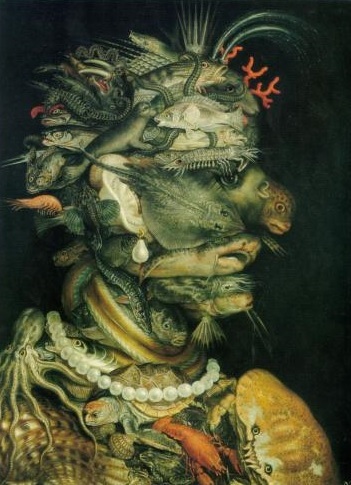 – ‘Water’ by Giuseppe Acrimboldo (1566). Curious about the customs and regularity of eating skate (the type of rays commonly dished up), I searched Google books and found recipes for fried skate, boiled skate, steamed skate, skate a la beaufort, skate a la plenty. Turns out, Bubba’s enumeration of shrimp from Forrest Gump equally applies to skate. In the 18th century, the fish was more common in France than England, but today the BBC has skate recipes which leads me to believe skate has been accepted as a tasty food source. According to an 1828 Angler’s Guide, skates were also plentiful in Scotland but the traveling writer wasn’t particularly impressed. The 1785 A View of the British Empire, most especially Scotland, cites Harwich in Essex as supplying London with 2000 tons of fish, including skate. As another writer of ichthyofauna records, presumably some English folk besides residents of Devon ate it as a cheap and nutritious food source. Across the channel, the opinion on the deliciousness of skate differs and there tends to be greater consensus. 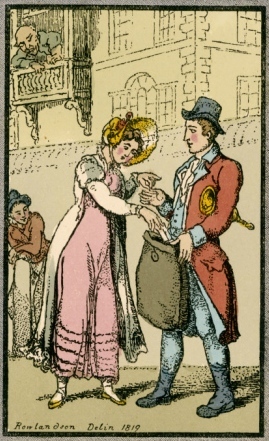 The Magazine of Domestic Comforts (1839) describes skate as “. . . held in high estimation, and is looked upon as one of the most delicate of fish.” Back in 2006 when I was in France, I saw skate in Parisian markets and on restaurant menus throughout the countryside. In fact, before I knew skate was a ray, I think I ate it at a restaurant in a teeny French town where the local butcher shop lady had blackened teeth and few, if any people, could or would speak English. I remember asking the hurried waiter to describe the fish and after confirming it as having crimped white flesh, I thought: fish, edible, smells fine – we are good here. Turns out, I believe I also ate pureed brains during that dinner because the waiter called it “cervelle” and ’twas not cervelle de canut (this is what happens when you eat in a town where a lady has blackened teeth!). Do you recall how the ray in Chardin’s still life is hung from a hook? Surprisingly, it is not for effect but rather practicality. 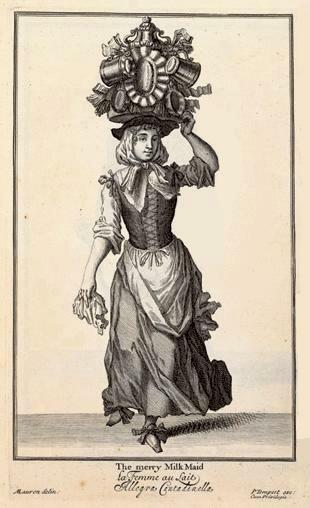 An 1897 Handbook of Fish Cookery explains: “Skate improves by being hung up for a day before using.” According to another fish guide, it should be hung head down (rather than Chardin’s head up) for two days in cool weather to fully develop its flavor and texture. The wise fisherman knows that their skin secretes mucus for a number of days after catch and will ward against consuming this anti-digestive . What is the mucus, you ask? Ammonia the skates have converted to urea which is stored in their blood while they’re alive. Nineteenth century Scots in the Hebrides used the hang dry method to prepare “sour skate” (salted and strongly smelling of ammonia) which, based on what I could find, sounds similar to the Norwegian lutefisk (salted and treated with lye). Of note to literary fans, Dickens, whose prolific pen seems to cover all topics known to man, edited a volume of Household Works in 1883. 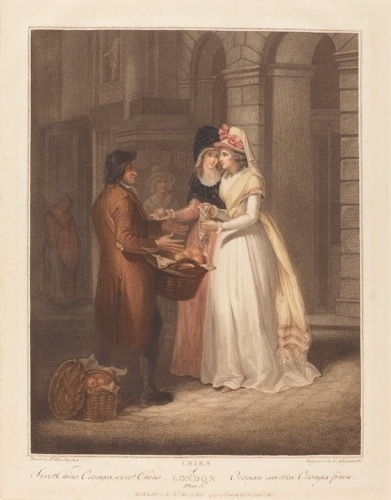 Whilst eating a sixpence dinner at a Fisheries Exhibition in South Kensington one evening it was remarked: “We were glad it was not skate, for a portion of this fish, with the redness which gives it the appearance of being undone, was served to a lady near us, and was rejected as being uneatable.” The reference to red flesh is a minor conundrum. Skate flesh is ever described as white, but when it’s uncooked or, in the lady’s case, undercooked, it looks like the picture below. Chagrin, chagrin, my dear. Seems the lady got a raw deal, after all.